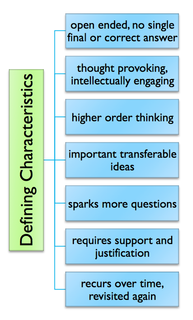 In the book Essential Questions McTighe & Wiggins (2013) define essential questions with seven defining characteristics. 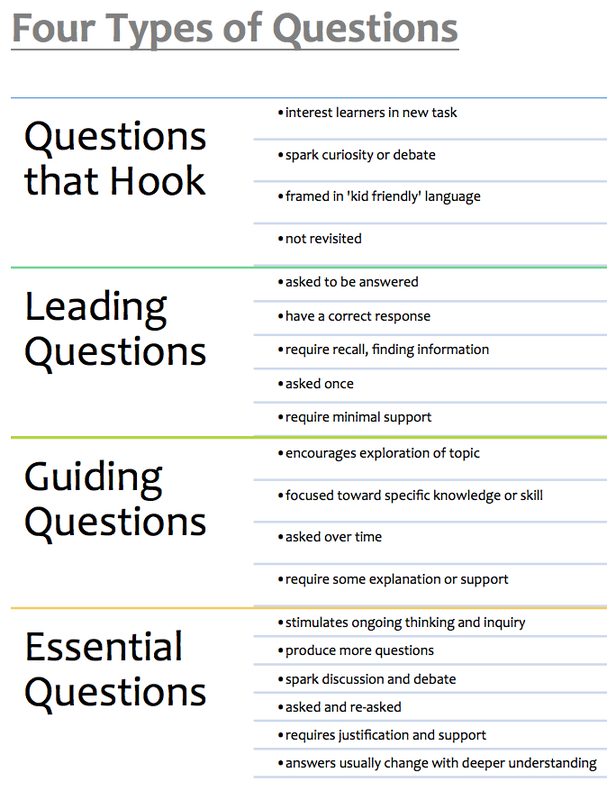 The authors provide the characteristics of the four types of questions used by classroom teachers. Working toward deeper understanding is required to craft and apply essential questions to classroom learning. The authors state that essential questions are created with purpose, intent and 'who' drives the learning (teacher vs student). The process of applying essential questions to classroom teaching practice is further outlined in this Professionally Speaking (Ontario College of Teachers magazine) titled Backward into the Future by Leanne Miller. This article outlines that essential questions can guide and shape an inquiry, are consistently applied to learning, provide a foundation for scaffolding curriculum, should be 'provocative' and 'multi-layered' and provide a framework for assessing student learning. (Miller, June 2004). 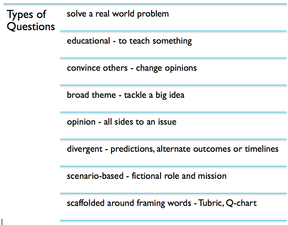 Apply a 'Q' chart to build better questions. Big Ideas and Essential Questions, Prezi, created by Terri Verhaegen, Sept. 28, 2013. Reviewing types of questions such as those posed on the Learning in Hand blog post Crafting Questions that Drive Projects, Tony Vincent provides a guiding process and insights into how essential questions can be developed and how they shape student inquiry. The types of questions are explored and several question creating resources are shared (Tubric, Scaffold for Writing Driving Questions). Tony Vincent posted a similar blog - Investigating Authentic Questions that shares additional digital tools, processes and information relevant to shaping student learning when asking essential questions. Rebecca Adler proposes that there are 5 powerful questions teachers can ask to promote thinking - What do you think? Why do you think that? How do you know this? Can you tell me more? What questions do you still have? Cloyce Weaver (March 2013) writes about enduring understandings and provides some examples taken from the Ontario curriculum. She provides a simple formula for writing an enduring understanding statement: concept - verb - concept. She outlines that an enduring understanding is relational where two concepts are combined by using a 'powerful' verb. Further, essential questions are created by using 'how' or 'why' when examining the enduring understanding. The Bluewater District School Board outlines some information about enduring understandings and essential questions. Designing good questions is the first step. The Q-chart provided on the Templates to Use page will also help shape a broad range of questions. Designing questions that can be effectively asked and answered using digital technology in order to inform student learning and inform teaching efficacy is the next step. Applying a variety of digital tools to survey or poll students will depend on what information is required, how the information is going to be used, and the digital fluencies of the students. 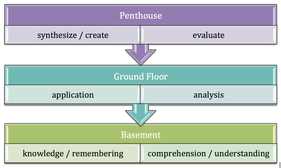 The Three Story Intellect combines the concepts of asking good questions with Bloom's taxonomy to create an image of three distinct levels. Each level is an essential component of the 'three story intellect'. Providing a range of questions in a lesson, unit or assessment can engage students with multiple means of showing what they know. Applying technologies to this process can be done at the beginning, middle or end points of the learning. Creating Enduring Understanding and Essential Questions from the Ontario Curriculum, Cloyce Weaver, March 14, 2014.